Washcloths are the small, versatile towels that are a staple in almost any bathroom, salon, spa or hairdressing business. If you own a business, quality washcloths ensure you provide your customers the best experience. If you don't own a business, quality washcloths allow you to wash up at the end of the day more comfortably and remove makeup or wash your face more efficiently. When you want to stock up on 12 x 12 premium white washcloths that are hefty at 1-lb per dozen and made of a cotton and polyester blend, look no further than Towel Super Center for the best options. Our premium wholesale-priced white washcloths are constructed of 86-percent cotton and 14-percent polyester. This gives you an incredible ability to enjoy drying off with a fabric that's both thirsty and hardy. Plus, you'll always be able to count on your premium white washcloths to resist staining and odor-absorbency thanks to cotton's natural tendency to stay fresh. Be sure that you're not buying cheap white washcloths that just fall apart. Instead, put your trust in wholesale premium washcloths from Towel Super Center today. The more units you order, the deeper your per white washcloth price becomes. Remember that you can always buy 12 x 12 premium white washcloths for commercial and residential use! They don't have any dyes, making them easier to bleach or to clean using a bleach alternative product that's made from eco-friendlier ingredients. 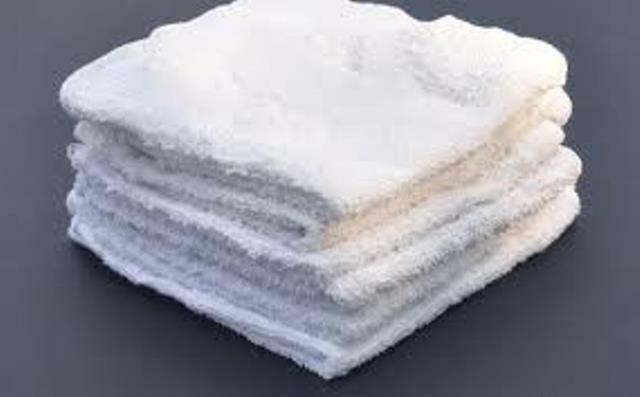 Where Can You Use Wholesale White Washcloths? Premium white washcloths are a staple in most businesses and homes. Use them in every bathroom as a smaller alternative to larger hand towels or bath towels. Have some on hand behind the counter at your commercial establishment for fast clean-ups of spills. Or simply keep a supply in your garage or car. You'll find so many uses for 12 x 12 premium white washcloths that you'll wonder how you lived or worked without them! While most linen stores sell washcloths, there are advantages to buying them online. Buying from Towel Super Center ensures quality. We specialize only in towels and washcloths, so you know we carefully source our washcloths to be of top quality. In addition, we offer wholesale prices, so you save money. Finally, we offer a larger selection than virtually any brick-and-mortar store, so you enjoy the exact washcloths you want from the comfort of your office or home. If you're looking for quality washcloths, order from Towel Super Center today. With wholesale prices, fast service and delivery to your door, we've made buying washcloths and towels simple and cost-effective.